im going to perry for the first time and am having trouble knowing what class to sign up for and when to show up. 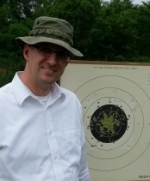 i would like to shoot 2700 bullseye match and my 22 and 45 have red dots mounted. what class should i register for? when should i arrive at the match? Most Marksman class shooters arrive on Sunday to attend SAFS and shoot the SAFS match. Do you have your current outdoor NRA Classification Card? You will register as that classification. If you don't have any pistols with Iron sights you are going to be in "Open" class in NRA. You can shoot NRA pistol practice on Tuesday, Do you know any other shooters from your state? State associations or clubs will coordinate team matches. If you just want to shoot the NRA matches that are part of the National Match score, you can register for just the .22, CF, and .45 championships, and show up about an hour before your relay time on Thursday. You will get relay assignments for each stage--you will likely fire on a different relay each day. I'm not a morning person, so I hate it when I shoot on 1st relay.